When the four Suyus come on the religious square of Sacsayhuam�n, they are playing stirred up percussion music. 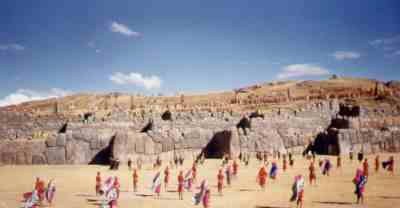 All of them point to the Inca, who takes place on the middle of the fortress. The festival began delayed this year because the parade was stuck in the traffic jam on their way to Sacsayhuam�n. The Incas go with the evolution of the world; all of them were taking to the 350m higher situated fortress by bus. All Suyus have their representatives of the three worlds: the Snake for the "world below", the Puma for "earth life" and the Condor for the "upper world of the gods". All of the participators know their position and all are dressed in the authentic dresses in accordance with their Suyu. It takes about half an hour for the Suyus to take position. Last come the Sapa Inca, his wife the Mama Occla, his many consorts, the high priest and the court on stage. At this moment the percussion music stops and a sapo�a (a wind instrument made out of reed) calls attention to listen to the highest dignitary. 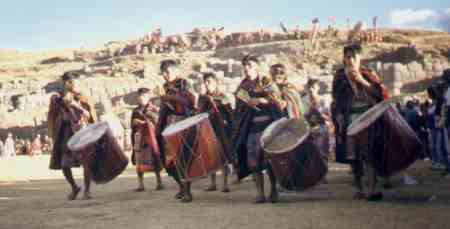 The Inca announces the New Year with authoritarian voice in Quechua. Every Suyu honors the god of the Sun and his representative on earth (Pachamama), the Sapa Inca. On his turn the Inca blesses the each Suyu, that all of them may be fertile and healthy. Music is played between the different blessings, creating a mysterious and an intensive atmosphere. For the first time the security backstage succeeded in keeping this part of Sacsayhuam�n free. 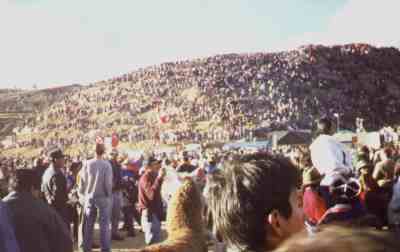 In the previous festival this hill was also full of people and had an annoying influence at the spectacle. The authenticity and magic of the Inti Raymi in Sacsayhuam�n was never so visual. Entrance to the fortress is free; seats can be rented at a stand around the main square. It is recommended renting one of these seats. This can be arranged in one of the agencies on and around the Plaza de Armas in Cusco. This offers a better view and above all a place to sit for sure. The festival on location takes about 5 hours and sitting down no is a superfluous luxury. Fares vary form $20 to $50, depending on the position. sometimes). But try to rent a seat. The organizers estimated that a 300 thousand visitors where in Sacsayhuam�n in Inti Raymi . People from all over the country and even the world come to see the festival. Every year there are accidents of people falling of the steeper parts of the fortress.